Let's cut to the chase: Lamentations of the Flame Princess Weird Fantasy Role-Playing Grindhouse Edition is a very good old school fantasy RPG with a very long name. Last summer, I wrote a lengthy five-part review of the Deluxe Edition of the game. Rather than repeat myself -- a first for me, I'm sure -- I recommend that anyone hasn't read my earlier review do so before proceeding with this one, which will concentrate on where the Grindhouse Edition differs from its predecessor, both for good and for ill, as well as on my further thoughts about LotFP WFRP. I'll endeavor to keep this review as grounded in specifics as I can, but, by necessity, there will be a certain amount of "philosophizing" in what follows, since I think the publication of this game marks a turning point in our little section of the hobby. Taken purely as a physical artifact, the Grindhouse Edition (hereafter GE) is an improvement over last summer's Deluxe Edition. Gone are the four staple-bound booklets, replaced with three perfect-bound ones. GE's three books cover the same ground -- Tutorial, Rules, Magic, and Referee -- as the earlier versions but Rules and Magic have been combined into a single 168-page volume that contains everything a player would need to play the game. That's potentially a shrewd move, if publisher James Raggi ever decides to sell the Rules and Magic book separately from the boxed set, something I'd personally recommend, given the 32.50€ (about $45.00 US) plus shipping cost of GE, which is more than twice that of the softcover editions of, for example, Labyrinth Lord and Swords & Wizardry, the two old school fantasy games with which GE can be most reasonably compared. On the other hand, GE is most definitely a slicker, dare I say, more "professional" package than either of those games, which is meant neither as a compliment to GE nor a criticism of Labyrinth Lord or Swords & Wizardry. What I mean is that GE is, at least superficially, much closer to the kinds of gaming products we've seen put out by game companies with more than one employee over the last decade or so. It's cleanly laid out, well edited, and nicely organized (though I could have done without the long s we see in its interior titles). It's also copiously illustrated throughout by a wide variety of illustrators, none of whose work looks amateurish or, to use the favored euphemism of our community, "hobbyist." Of course, even a cursory look at the artwork of GE quickly makes it clear why I said that it was only superficially closer to the RPG products we see outside the old school renaissance. True to its name, GE is filled with lurid, violent, and often bizarre artwork, some of which borders on the prurient and the puerile. This is clearly a deliberate choice on the part of Jim Raggi, reflective of his own tastes and it definitely does give GE its own unique look and feel, in much the same way that, say, Labyrinth Lord's exclusive use of Steve Zieser for its revised edition did. And, as I discussed earlier, it's pretty clear that Raggi believes that at least part of the hobby's early popularity was due to its notoriety as "dangerous," something he hopes to evoke through the visceral esthetic to which he's attached LotFP WFRP. In a similar vein, GE carries an "Ages 18+ Explicit Content" warning on the back of its box. Again, I'm pretty sure that this is at least partly an attempt to harken back to days before roleplaying came to be viewed as a harmless, "kiddie" game, when it was still primarily an adult pastime. I certainly don't begrudge Raggi his decision to go this route and perhaps he's on to something, since GE has a print run of 2000 copies, compared to the Deluxe Edition's 600. Unless I'm woefully uninformed, that's a pretty sizable print run for any RPG these days, never mind a deliberately old school one. If Raggi actually sells through that many copies, it's an unambiguous triumph and a vindication of the approach he's adopted. Like the Deluxe Edition, GE's Tutorial book is lengthy and takes obvious inspiration from the 1983 edition of the D&D Basic Rules, right down to the inclusion of not one but two choose-your-own-adventure style introductory adventures. My feelings about such adventures aside, I can't deny that I found them jarring in a game carrying an explicit content warning. Granted, that's a prejudice on my part; there's no reason why an adult coming to the game wouldn't find adventures of that sort helpful. The same might also be said of the other basic topics covered in the Tutorial book, including the example of play that takes up more than 20 pages of its 96. For myself, I continue to question the utility of a Tutorial volume as extensive as this one in a game aiming for an adult audience and find it remains my least favorite part of LotFP WFRP by far. The Rules and Magic book, on the other hand, is even better than before, which is saying something. Just about everything in the original versions has been further polished and refined. There are little tweaks here and there, as well as some new additions, but, at base, the rules haven't changed noticeably from the Deluxe Edition; they're just more clearly and attractively presented. I'd be hard pressed to cite any specific changes from last summer's release rules-wise, so that ought to tell you how compatible GE is with its predecessor. The same can be said of magic. Raggi's rewriting of standard D&D spells remains one of my favorite things about LotFP WFRP and it's once again used to good effect here, with (I believe) the inclusion of a few more spells. I should note that the artwork in the Rules and Magic book very strongly reinforces the fact that Raggi, like Gygax, prefers the Early Modern period to the medieval. There's a strong 16th-17th century vibe in the illustrations that called to mind both Howard's Solomon Kane yarns and the Old World of Warhammer. I am certain this was intentional. The Referee book is, I think, improved over its Deluxe Edition predecessor. For one, there are now some example magic items included, so as to provide models for neophytes in the creation of their own. Likewise, to make up for the loss of the two adventures included in the Deluxe Edition, there's a well-done scenario called "A Stranger Storm" could easily be used to kick off a campaign. Like all of Raggi's adventures, it's moody and potentially deadly but, moreso than some, I think it better illustrates the kind of setting he imagines for LotFP WFRP. Of course, there are still no fully statted examples of monsters in the game, nor is there a mini-Random Esoteric Creature Generator included in this book. I fully understand that Raggi does not approve of "generic" monsters and feels they weaken the game's evocation of the weird, but, even so, I don't think it's unreasonable to provide more tools to aid referees in this regard, especially in a game that exerts so much effort elsewhere in holding the hands of newcomers. 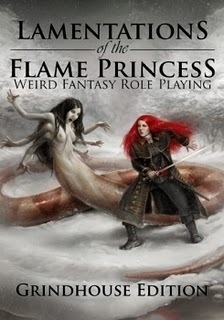 Esthetic considerations aside, my biggest continued gripe about Lamentations of the Flame Princess Weird Fantasy Role-Playing is that it wants to be a game that might appeal equally to tyros and to experienced players but doesn't quite strike the right balance to do so in terms of its content. At times, the tone and subject matter feel very unduly pedagogical, while at others it seems as if Raggi assumes beginners should be able to understand things, like monster creation, that even some old hands have difficulty with. Now, I'm deeply sympathetic to Raggi's situation here and I don't think any of the decisions he made are catastrophic, nor can I think of a RPG in print today that succeeds where he fails. But GE is a very good product, a terrifically accessible and complete old school fantasy game, so it galls me all the more that it leaves a man stranded at third when, with a bit more refinement, it could have brought him home. Ultimately, GE impressed me most because it shows that it is possible to create an affordable and complete boxed RPG in today's market. Likewise, it's also possible to create one that favorably compares to the products of larger companies without having to compromise one's creative vision. Whether one likes it or not, GE is the game that Jim Raggi wanted to create and I can't help but applaud him for having done so. His vision is not my vision, though, nor do I suspect it will be that of all old school gamers, but that's not a bad thing. The one thing that GE is not is bland; it's chock full of flavor. In addition, I think it definitely raises the bar when it comes to production values within the old school renaissance. One can reasonably argue with how Raggi chose to present his game, but one cannot deny that he executed that presentation very well -- so well, in fact, that I'm surprised that GE's release hasn't triggered more discussion about the importance (or not) of high production values in old school renaissance releases. I hope it does, because I think it's a discussion well worth having. Buy This If: You either don't already own the Deluxe Edition or are looking for a well-presented and complete old school fantasy RPG. Don't Buy This If: You either already own the Deluxe Edition or have no need for yet another old school fantasy RPG, no matter how well-presented or complete. Here is what I have never quite understood. Why is it "weird"? I have not found anything in the book that screams weird to me. I have seen tips on doing a "weird" game or even a "dark" one, but honestly what are getting here that we don't get from OD&D and a tip sheet on how run a "weird" game. At least the other way around we get monsters with OD&D. The art is fantastic, there is even a cool narrative one can build for the "Flame Princess" on the art alone. Interesting given the source of the narrative is someone that has professed a dislike for characters and more for locations. but honestly what are getting here that we don't get from OD&D and a tip sheet on how run a "weird" game. A complete, in-print, and clear fantasy RPG you can run out of the box, which is nothing to sneer at. "Weird" is, I think, mostly a nod to the fact that the Raggi's take on fantasy is heavily influenced by authors like Poe, Machen, Lovecraft, Smith, etc. I don't believe the game is meant to "emulative" except in the same way that most old school RPGs are emulative of their creators' inspirations. involving or suggesting the supernatural; unearthly or uncanny: a weird sound; weird lights. They key word here is SUGGESTING. LotFP tends towards monsters that are horrific and unique, and just on the edge of perception; picture Call of Cthulhu critters possibly. This aspect of the unknown, that you don't now what the capabilities of the creatures you face are generates a sort of fear or dread of the unknown. So fights with such are to avoided or very carefully planned if a party is to survive. While this can apply to most fantasy games, they tend to be more overt, with elves, magic items, and monsters being very much the adventuring norm rather than rarities. Maybe my expectations are tainted after doing nothing but playing horror games for the last 25 years. I can't speak to that, but I would say that LotFP needs to be viewed, first and foremost, as a fantasy game in the tradition of D&D. It does differ from D&D in various ways, most of them subtle and having to do with its presentation and emphases. It's neither a horror game nor do its rules provide any mechanical support for emulating horror. Rather, it's a very traditional FRPG with specific inspirations. I purchased the game earlier this evening, before I saw your review, James. I enjoyed immensely skimming through the immediate download PDFs, and very much look forward to the arrival of the box. I am not squeamish in the least, and I thought most of the art was great (how often do you get to see wigged, decadent, "Frenchified" Elves, after all?). My only irritation is with the repetition of the eyeball-pierced-by-dagger motif in one of the books. I will never ever get used to reading "WFRP" and it not meaning "Warhammer Fantasy Roleplay". Glad to hear your opinions on this! I'll be picking my copy up in July, along with Vornheim! $45 and no monsters or rules how to make them counts as "affordable and complete"? There are rules for how to create them, just no fully statted out examples of monsters, which I think is a big mistake. Ditto on the monsters. You can't have a RPG without them. Personally I consider monsters to be wasted space. Does every retro clone need to have a stat block for a goblin? That said it is a bit odd to include a tutorial book but no monsters. For my own needs monster entries, unless new entries, are not needed. As far as the pricing I too was put off by the price from lotfp website, but if you look for it stateside you'll find it for 30 bucks. I have a copy of the Deluxe Edition and I think that it's a very smart piece of work but the rules' lack of monsters is an odd and polemical stance that definitely undercuts their usefulness. It's obvious that Lamentations was written to encourage a certain style of play and I can respect that, but in some ways its approach can be just as limiting as rules that impose an overly specific campaign setting. I'm surprised that GE's release hasn't triggered more discussion about the importance (or not) of high production values in old school renaissance releases. I think there's a straightforward first-order explanation for the lack of discussion: right now Raggi is one of fewer than a half-dozen guys willing to put that kind of time and money into the aesthetics of an 'OSR' product. Everyone else is too much hemming/hawing. It's embarrassing to compare the average OSR 'release' to LotFP (though LotFP prompts more than its share of embarrassment too, of course - for reasons you've pointed out above). For all James's adolescent more-metal-than-thou posturing, he put his nose to the grindstone and his money where his mouth is, and did all the annoying business/management/semi-creative stuff that normal people can't be bothered with. He's young, his wife is obviously inhumanly patient and generous, he's got time and energy to spare, he doesn't mind looking a bit foolish, but he knows enough to work hard to avoid it. Rare enough in the 'real world'; rarer still in a niche hobby full of middle-aged guys with 'real' jobs, kids, and no knack for aesthetics. James has gone all-in with this product; he wants to make LotFP a career. Since basically no one else in the 'OSR' is going to do that, it's gonna be hard drawing direct comparisons between his choices and everyone else's. Production values matter in the gaming business. They don't matter when John Q. Nerdlington is sharing his 8-page PDF with his buddies in the comments of somebody's blog. In other words, I'd happily lend out stuff of mine that I'd feel uneasy selling, if I couldn't guarantee its performance. LotFP is moving well out of that gifting/borrowing economy. Surely the Rogues understand that? I'd like to hear from someone else (besides myself) who's played it. What's most interesting about Weird Fantasy as a product is that it's a well-articulated vision of what D&D means to Raggi, a serious and thoughtful player. From it to suceed as a new game, someone has to be able to say, "when I play with these rules, it doesn't feel like D&D anymore, it feels like X." Personally, I think that the way to get to X is not with a new game but with new adventures. Like Death Frost Doom. Played it and thoroughly enjoyed it. However, I don't in any way feel it scratches my OSR itch. I've said it before - this is a game for today that has the benefit of using familiar terms and (some) ideas. It doesn't try to be a clone and it isn't. The flavour is totally different. I like it a lot but I haven't been able to play it as a campaign, for our group, it's a one-shot game for when we're 'between games'. To everyone who's playing RPGs without monsters, I regret to inform you that crowking says you can't have your RPGs anymore. Pulp Fantasy Library: Gather, Darkness!